Scion has a couple of new models that should garner lots of attention this year. The first is iQ, an all new “premium micro subcompact” designed to meet the needs of “a new trendsetting generation of urban drivers,“ Toyota says. 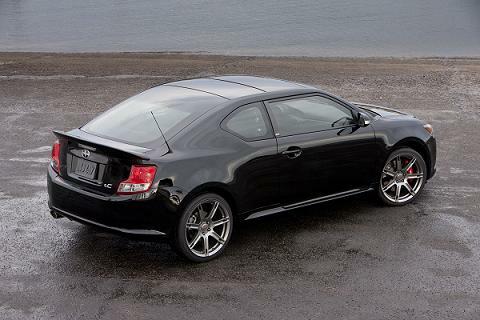 The other is an all-new tC coupe to usher in the second generation of the popular model. “The iQ’s profile, defined by a strong and high beltline, glides from the large, stout headlamps, up the A-pillar, across the roof and wraps around the rear, emphasizing the iQ’s geometric shape. 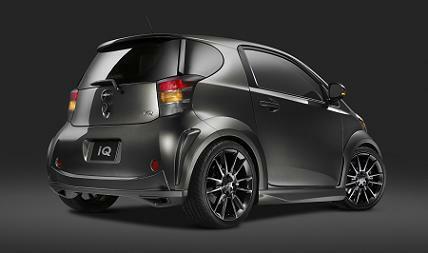 Side mirrors with integrated turn signals accent the clean design,” a Scion news release says. It adds, “The rear emphasizes the vehicle’s modern style. Trapezoidal lines run toward the wheels, from the hatch to the bumper’s rear diffuser-like accent, creating a substantial presence. With a 78.7-inch wheelbase and a unique suspension design – consisting of MacPherson struts up front, and a torsion beam rear suspension – the three-door hatchback can deftly maneuver through city traffic.” “ In addition, its overall length of only 120.1-inches, width of 66.1-inches, and short front and rear overhangs create a confident stance that still allows the iQ to fit into virtually any urban parking scenario. “ To be able to come up with such a compact car, Toyota relied on some engineering innovations like a compact air-conditioning unit, inverted front-mounted differential, and electronic power-steering system with compact steering column. These help cut the car‘s front end length. The iQ also has a flat gas tank beneath the floor to reduce rear overhang. What most people will likely find coolest about the iQ, in addition to its styling, is the world‘s first functional “3+1” seating, which makes the iQ the world’s smallest four-passenger vehicle. Scion says that with “the driver’s and front-passenger’s seats being slightly offset, this innovative seating arrangement allows for one adult behind the front passenger and a child, small package, or pet behind the driver. A first for Scion, extra-slim front seat backs are utilized to provide rear passengers with ample legroom.” The company adds, “ The rear seats are extremely versatile, featuring a 50/50 split and the ability to fold flat, creating enough storage to accommodate up to two golf bags. “ Dsfety equipment is plentiful, including Vehicle Stability Control (VSC), an anti-lock brake system (ABS) with Electronic Brake force Distribution (EBD), Brake Assist (BA) and Traction Control (TRAC). 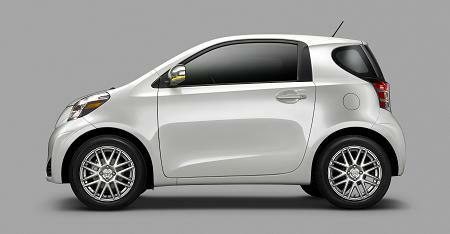 The iQ will come standard with 10 SRS airbags, including the world's first rear-window curtain airbag. Other airbags include driver- and front-passenger airbags; driver- and front-passenger seat-mounted side airbags; side curtain airbags; driver- and front-passenger knee airbags; and a Scion-first driver seat-cushion airbag. The 2011 iQ is equipped with a 1.3-liter, four-cylinder engine that produces over 90 horsepower and features the latest dual VVT-I. The iQ’s engine is combined with a Continuously Variable Transmission (CVT) that helps deliver smooth acceleration and excellent fuel efficiency. The iQ will be rated as an Ultra Low Emission Vehicle (ULEV-II), and it is expected to achieve a combined fuel economy in the high 30s, comparable to similar vehicles that feature less passenger and cargo capacity. The iQ comes standard with a six-speaker audio system and is available with multiple audio head units for various degrees of audiophiles. All iQs will be outfitted with USB and auxiliary ports, allowing personal devices to be easily integrated into the car. Steering-wheel-mounted controls command the audio system to adjust volume and shuffle through music sources such as CD, AM/FM, auxiliary input, or a library from your iPod® or other USB device. More power are the bywords for the second generation tC. It has an all-new 2.5-liter inline four-cylinder engine with dual VVT-i that generates 180 horsepower, 19 more than the previous model, and 11 additional lbs.-ft of torque. In addition to increases in power, the new engine delivers an increase in fuel economy all while lowering emissions. Performance is further improved and heard through a new intake manifold design and a sport-tuned exhaust system that delivers a bold and aggressive sound. The tC features two all-new transmissions: the six-speed manual transmission has improved shift-feel and adds to the car’s already fun-to-drive character, and a new six-speed automatic gains two gears along with sequential-shift. The 2011 tC enters its second-generation riding on a new platform, including a specially tuned MacPherson strut front-suspension and a double-wishbone rear-suspension that rides lower than the previous model. Larger 18-inch aluminum-alloy wheels are wrapped in wider tires, giving the tC a broader stance and elevated handling characteristics. The new model also comes standard with larger 16-inch disc brakes on all corners. Inside you’ll find what the company is calling a helmet-inspired cabin shape, which was adopted from the Calty-designed Scion FUSE concept, which was unveiled at the 2006 New York Auto Show. The instrument-panel, gauge cluster and center-console all face inward in a V-shape, making controls easily accessible. The new tC comes standard with an AM/FM/CD/USB audio system that features eight speakers. As with all Scion models, steering-wheel-mounted controls allow the driver to easily navigate through all of their music. XD The Scion xD is getting changes to both the interior and exterior for 2011. You‘ll find a new honeycomb-style grille, and a rear color-keyed spoiler for enhanced styling. Vehicle ride height has been adjusted, and the shock absorber tuning has been optimized for enhanced handling. The interior receives a new fabric for the door panel armrest. The base MSRP ranges from $15,045 for the manual transmission model to $15,845 for the automatic transmission an increase of $145, or 0.9 to 1.0 percent. XB The 2011 xB is upgraded with an aggressive new look on the outside and added comfort and convenience on the inside. The enhancements to the 2011 xB come with a $150 price increase over the 2010 model resulting with MSRPs of $16,000 and $16,950 for manual and automatic transmission models, respectively. The xB enters the 2011 model year with fresh exterior styling including changes to the front and rear bumpers, grill, headlights and taillights, which together reveal a more aggressive demeanor. The new front bumper features enlarged outer vents, improving the appearance of the vehicle’s stance. The front grille features a new honeycomb pattern and improved headlamp design. The single rear backup lamp has been integrated into combination lamps to produce a more refined appearance. Driver- and front-passenger seats are redesigned to include larger bolsters for greater comfort and stability. Front and rear seats have a new light gray fabric with a geometric pattern for the seating surfaces contrasted by black fabric covering the bolsters, bases and backs. A combination center console with sliding armrest has been added to increase driver comfort and utility. Improved gauge-cluster design with black background, along with a separate clock and outside temperature display, provides better visibility to information. Completing the changes, the steering wheel now includes both telescopic and tilt functions.